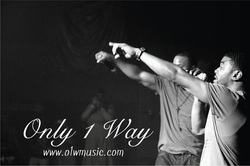 Only 1-Way aka O1W is an urban gospel group from Detroit, Michigan consisting of two members (Chris "Truth" Jones and Matt "King Jones). Both members uniquely express their love for God the Father and His only begotten son Jesus Christ of Nazareth through forms of singing, dance, and rap. O1W was birthed from a prophecy during a youth service held at their home church of Hope Evangelical Ministries in the spring of 2003, after performing in front of the congregation, Reverend, Dr. Kevin L. Young immediately stood and witnessed to each of them by sharing the vision that God gave him, telling the young men that they were “called of God to the youth of the nations" and that they were to be "totally set apart", then giving them the name "Only 1-Way”. Soon after he began to groom them for ministry, teaching and developing each member that talent alone wasn't enough, but it was going to be the anointing that would destroy the yokes and change lives. As instructed by the Holy Spirit, he carefully shaped, molded, and equipped each member of the group with the wherewithal to fulfill all that God had in store for them to accomplish according to the prophecy. O1W has since gone on to travel across the country spreading the gospel of Jesus Christ through their music, videos, and performances. They have picked up 5 DMA Nominations (Detroit music Awards) 2 ROG music Awards Nominations (Rhythm of Gospel Music Awards) along the way. In the summer of 2010, O1W released the studio album, BreakThru which featured the hit songs "I Get It In", Ready 4 Whateva", and "I Am". In 2011 only 1-way won song of the year with Independent Gospel Awards for their hit single "I Get It In". With a radio friendly style, unique sound, dynamic and anointed lyrics and powerful message, only 1-Way is definitely going to be the next big thing and a force to be reckoned with in music and ministry for years to come.